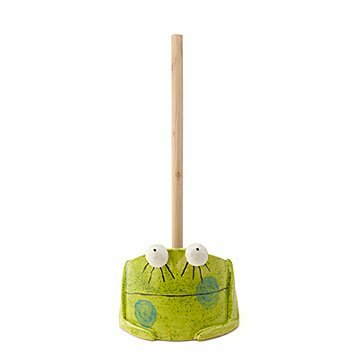 Once a prince, this ceramic frog’s coming to your home to hide your plunger from view. Ribbit. Don't panic—that's just the sound of your new bathroom buddy saying "hello." Handmade by ceramicist Gitti Lindner and fitted with floor-protecting rubber pads, he might have been a prince once upon a time. Now he's coming to your home to hide your plunger from view. That's what we call heroism. Handmade in California.